16:00 alle 20:00 : Ritiro pacchetto gara e ultime iscrizioni. Espace Prarial Montgenèvre village. 06:30 alle 09:30 : Ritiro pacchetto gara (fino alle 13:10 per la Sky Race Solidale). Espace Prarial Montgenèvre village. Tre primi di ogni categoria. Sky race Chaberton : Sacca acqua da 1 litro almeno e gel per la gara , Giaccha da pioggia con cappuccio, vestiti tecnici (gore tex o altre), un fischietto e una coperta di emergenza. Sky race des Anges e Sprint Sky Race : una porta borraccia (mini 75cl) e una giacca vento. Ristori e medici saranno presenti lungo il percorso. Ristori fuori zona proibito. 2 ristori per la Sky Race Chaberton, uno per la Sky Race des Anges e Sprint Sky Race. Nessun rimborso, maglietta puo essere rimosso da un altra persona, non verranno effettuati spedizioni . 4pm to 8pm : Registration and race pack. Espace Prarial Montgenèvre village. 06.30am to 09.30am : Race pack (until 1.10pm for Sky Race Solidaire). Espace Prarial Montgenèvre village. All Competitors must be covered by an individual accident insurance. The race is also covered by an insurance. Late registration on friday from 2pm to 7pm, saturday 5am to 8.30am and from 3pm to 7pm and on Sunday from 8.00am to 10.00am. Sky race du Chaberton : 75cl or more hydration backpack, energy gels, technical jacket with hat, a whistle and emergency rescue foil. 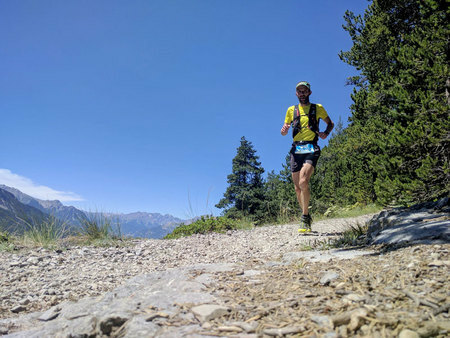 During the race, participants are prohibited from receiving any help or assistance other than the one offered by the Organization 3 feeding stations for Sky Race Chaberton, one for Sky Race des Anges and Sprint Sky Race . Race Timing; Race time is started at the checking of the timing chip at the start and stopped when the chip/dibber is checked at the timing station at the finish. In case the weather conditions are severe, the organisers reserve the rights to change the routing and format, or part thereof, of any leg, race or day at any time during the event. 3 first of each category. Competitors hereby explicitly authorise the Organiser of the Competition as well as their stakeholders, such as partners, sponsors and the media, to use any still or animated (audio-visual) images on which Competitors may appear and taken on the occasion of their participation in the Competition. - Name and last name of the person presenting the claim, ID, and to whom he/she represents. - Data of the participants affected. Bib number.